We are proud to represent this exquisite, 55 meter expedition craft MY Ark Angel, fully refit by HYS Yachts in 2011. It is a complete global circumnavigating Superyacht, with dual helipads, a safe-room, 12,000 Nautical Mile range, beam-lift deployment of the two included tenders through fold-out side bulwarks. It is designed to take on the worst sea conditions without compromising stylish luxury. Solid steel hull, commercial-grade mechanical systems and state-of-the art electronics and convenience systems make this a spacious and unique global explorer. She is capable of taking her owners and guests to virtually any point on the planet in complete safety and comfort.Ark Angel boasts a spectacular 650 sq. ft. owner’s suite, 8 guest suites, including 3 en-suite VIP staterooms and crew accommodations for 17. There are seemingly endless social areas for guests, includinga large sundeck, observation lounge with Jacuzzi and a massive lounge.The large, aft 3-ton helipad will accommodate almost any conventional passenger helicopter and a smaller 1.2 ton helipad forward is set up for touch and go operations.Ark Angel’s 2011 refit by the excellent HYS yard in Subic Bay included installation of a full suite of Furuno navigation equipment, a complete engine rebuild, stabilizer system rebuild, installation of many, many new systems including new power generation systems, a custom-designed wet exhaust system, a 7-meter Zodiac tenderwith 175 Hp outboard, a 7-meter Hammerhead tender with 220 Hp Styre Jet Engine and much more.The boat is truly world-class and is presented ‘as-new’. She is meticulous in her refit and maintenance and every inch of her is genuinely meticulous. Ark Angel must be seen to be appreciated. If you’re looking for an excellent value on an exquisite and turn-key global expedition craft, a trip to the Philippines for an inspection is assured to be a worthwhile trip. She compares very favorably to expedition superyachts in this size range costing 2-3 times as much as she can be purchased for. United Yacht Sales New Jersey would love to guide you through a personal showing of this 182' Custom Ark Angel 2011. 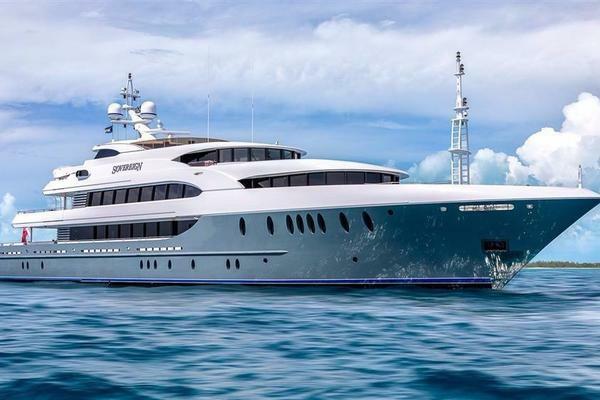 This yacht for sale is located in Unknown Philippines and priced at $5,800,000. For a showing please contact us by filling out the form on this page and we will get back to you shortly! Main Engine:Hanshin 1300 HPsPropeller: 5-BladeMain Generators: 2 x TriPower – 170KWAux Generator: 1x TriPower – 110KWBow Thruster: Quantum – 150 HP4-Fin Zero-Speed Stabilizers: QuantumCustom Designed and Built Inox Wet Exhaust System: Silencer MarinePlease Note: Main engine fully overhauled in 2012 by Goltens Singapore. Stabilizers fully rebuilt in 2014 by Quantum.